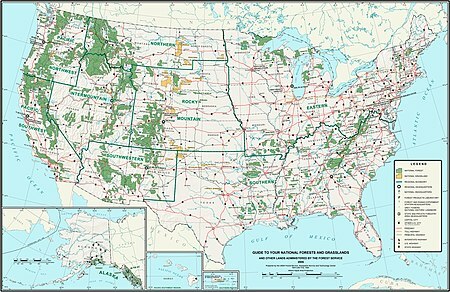 ^ a b c d e f "Land Areas of the National Forest System" (PDF). U.S. Forest Service. November 2015. Archived from the original (PDF) on January 16, 2016. Retrieved January 16, 2016. ^ "About Us – Meet the Forest Service". U.S. Forest Service. Archived from the original on February 21, 2013. Retrieved October 22, 2012. ^ a b Gorte, Ross W.; Cody, Betsy A. (November 7, 1995). "The Forest Service and Bureau of Land Management: History and Analysis of Merger Proposals". Congressional Research Service Reports for Congress. Archived from the original on February 21, 2013. Retrieved October 22, 2012. ^ a b c d e f "The National Forests of the United States" (PDF). The Forest History Society. Archived from the original (PDF) on February 21, 2013. Retrieved October 14, 2012. ^ a b "Find a Forest by State". U.S. Forest Service. Retrieved October 22, 2012. ^ a b "U.S. Board on Geographic Names". U.S. Geological Survey. Retrieved October 21, 2012. ^ "Allegheny National Forest". U.S. Forest Service. Retrieved October 14, 2012. ^ a b c d e f g h i j k l m n Mohlenbrock, Robert H. (2006). This Land: A Guide to Eastern National Forests. Berkeley, California, USA: University of California Press. ISBN 978-0-520-23984-5. Retrieved December 12, 2012. ^ "Angeles National Forest – History & Culture". U.S. Forest Service. Retrieved September 25, 2016. ^ "Angeles National Forest". U.S. Forest Service. Retrieved October 14, 2012. ^ "Angelina National Forest". U.S. Forest Service. Retrieved October 14, 2012. ^ a b c d e f g h i j k l m n o Mohlenbrock, Robert H. (2006). This Land: A Guide to Central National Forests. Berkeley, California, USA: University of California Press. ISBN 978-0-520-23982-1. Retrieved December 12, 2012. ^ "Apache-Sitgreaves National Forest". U.S. Forest Service. Retrieved October 14, 2012. ^ "Apalachicola National Forest". U.S. Forest Service. Retrieved October 14, 2012. ^ a b "Arapaho and Roosevelt National Forests and Pawnee National Grassland". U.S. Forest Service. Retrieved October 14, 2012. ^ "Ashley National Forest". U.S. Forest Service. Retrieved October 14, 2012. ^ "Beaverhead-Deerlodge National Forest". U.S. Forest Service. Retrieved October 15, 2012. ^ a b c d e f "National Forests in Mississippi". U.S. Forest Service. Retrieved October 15, 2012. ^ "Bighorn National Forest". U.S. Forest Service. Retrieved October 15, 2012. ^ "Bitterroot National Forest". U.S. Forest Service. Retrieved October 15, 2012. ^ "Black Hills National Forest". U.S. Forest Service. Retrieved October 15, 2012. ^ "Boise National Forest". U.S. Forest Service. Retrieved October 15, 2012. ^ "Bridger-Teton National Forest". U.S. Forest Service. Retrieved October 15, 2012. ^ "Caribou-Targhee National Forest". U.S. Forest Service. Retrieved October 15, 2012. ^ "Carson National Forest". U.S. Forest Service. Retrieved October 16, 2012. ^ "Chattahoochee-Oconee National Forest". U.S. Forest Service. Retrieved October 17, 2012. ^ "Chequamegon-Nicolet National Forest". U.S. Forest Service. Retrieved October 17, 2012. ^ "Cherokee National Forest". U.S. Forest Service. Retrieved October 17, 2012. ^ "Chippewa National Forest". U.S. Forest Service. Retrieved October 17, 2012. ^ "Chugach National Forest". U.S. Forest Service. Retrieved October 17, 2012. ^ a b c d e f g h i j k l m n o p q r Mohlenbrock, Robert H. (2006). This Land: A Guide to Western National Forests. Berkeley, California, USA: University of California Press. ISBN 978-0-520-23967-8. Retrieved December 12, 2012. ^ "Cibola National Forest and National Grasslands". U.S. Forest Service. Retrieved October 17, 2012. ^ "Clearwater National Forest". U.S. Forest Service. Retrieved October 17, 2012. ^ "Cleveland National Forest". U.S. Forest Service. Retrieved October 17, 2012. ^ "Coconino National Forest". U.S. Forest Service. Retrieved October 17, 2012. ^ "Colville National Forest". U.S. Forest Service. Retrieved October 17, 2012. ^ a b c d "National Forests of Alabama". U.S. Forest Service. Retrieved October 17, 2012. ^ "Coronado National Forest". U.S. Forest Service. Retrieved October 17, 2012. ^ a b c d "National Forests in North Carolina". U.S. Forest Service. Retrieved October 17, 2012. ^ "Custer National Forest". U.S. Forest Service. Retrieved October 17, 2012. ^ "Daniel Boone National Forest". U.S. Forest Service. Retrieved October 18, 2012. ^ a b c "National Forests of Texas". U.S. Forest Service. Retrieved October 18, 2012. ^ "Green Ash-Overcup Oak-Sweetgum Research Natural Areas". National Park Service. Archived from the original on February 21, 2013. Retrieved October 19, 2012. ^ a b "Deschutes & Ochoco National Forests & Crooked River National Grassland". U.S. Forest Service. Retrieved October 19, 2012. ^ "Dixie National Forest". U.S. Forest Service. Retrieved October 19, 2012. ^ "Eldorado National Forest". U.S. Forest Service. Retrieved October 19, 2012. ^ "El Yunque National Forest". U.S. Forest Service. Retrieved October 19, 2012. ^ "El Yunque National Forest" (PDF). U.S. Forest Service. Archived from the original (PDF) on August 18, 2013. Retrieved August 17, 2013. ^ a b "Finger Lakes National Forest". U.S. Forest Service. Retrieved October 19, 2012. ^ "Fishlake National Forest". U.S. Forest Service. Retrieved October 19, 2012. ^ "Flathead National Forest". U.S. Forest Service. Retrieved October 19, 2012. ^ a b "Francis Marion and Sumter National Forests". U.S. Forest Service. Retrieved October 19, 2012. ^ "Fremont-Winema National Forest". U.S. Forest Service. Retrieved October 19, 2012. ^ "Gallatin National Forest". U.S. Forest Service. Retrieved October 19, 2012. ^ "George Washington and Jefferson National Forests". U.S. Forest Service. Retrieved October 19, 2012. ^ "Gifford Pinchot National Forest". U.S. Forest Service. Retrieved October 19, 2012. ^ "Gila National Forest". U.S. Forest Service. Retrieved October 19, 2012. ^ a b c "Grand Mesa Uncompahgre and Gunnison National Forests". U.S. Forest Service. Retrieved October 19, 2012. ^ "Green Mountain National Forest". U.S. Forest Service. Retrieved October 19, 2012. ^ "Helena National Forest". U.S. Forest Service. Retrieved October 19, 2012. ^ "Hiawatha National Forest". U.S. Forest Service. Retrieved October 19, 2012. ^ "Hoosier National Forest". U.S. Forest Service. Retrieved October 19, 2012. ^ "Humboldt-Toiyabe National Forest". U.S. Forest Service. Retrieved October 19, 2012. ^ "Huron-Manistee National Forests". U.S. Forest Service. Retrieved October 19, 2012. ^ "Idaho Panhandle National Forests". U.S. Forest Service. Retrieved October 19, 2012. ^ "Inyo National Forest". U.S. Forest Service. Retrieved October 19, 2012. ^ "Kaibab National Forest". U.S. Forest Service. Retrieved October 20, 2012. ^ "Kisatchie National Forest". U.S. Forest Service. Retrieved October 20, 2012. ^ "Klamath National Forest". U.S. Forest Service. Retrieved October 20, 2012. ^ "Kootenai National Forest". U.S. Forest Service. Retrieved October 20, 2012. ^ a b "Lake Tahoe Basin Management Unit". U.S. Forest Service. Retrieved September 30, 2013. ^ a b "Land and Resource Management Plan: Lake Tahoe Basin Management Unit" (PDF). United States Forest Service. Retrieved October 2, 2013. ^ "Overview - Land Between The Lakes National Recreation Area". Retrieved 2015-09-02. ^ "Lassen National Forest". U.S. Forest Service. Retrieved October 20, 2012. ^ "Lewis and Clark National Forest". U.S. Forest Service. Retrieved October 20, 2012. ^ "Lincoln National Forest". U.S. Forest Service. Retrieved October 20, 2012. ^ "Lolo National Forest". U.S. Forest Service. Retrieved October 20, 2012. ^ "Los Padres National Forest". U.S. Forest Service. Retrieved October 20, 2012. ^ "Malheur National Forest". U.S. Forest Service. Retrieved October 20, 2012. ^ "Manti-La Sal National Forest". U.S. Forest Service. Retrieved October 20, 2012. ^ "Mark Twain National Forest". U.S. Forest Service. Retrieved October 20, 2012. ^ "Medicine Bow-Routt National Forest & Thunder Basin National Grassland". U.S. Forest Service. Retrieved October 20, 2012. ^ "Mendocino National Forest". U.S. Forest Service. Retrieved October 20, 2012. ^ "Modoc National Forest". U.S. Forest Service. Retrieved October 20, 2012. ^ "Monongahela National Forest". U.S. Forest Service. Retrieved October 20, 2012. ^ "Mt. Baker-Snoqualmie National Forest". U.S. Forest Service. Retrieved October 20, 2012. ^ "Mt. Hood National Forest". U.S. Forest Service. Retrieved October 20, 2012. ^ a b "Nebraska National Forests and Grasslands". U.S. Forest Service. Retrieved October 20, 2012. ^ "Nez Perce National Forest". U.S. Forest Service. Retrieved October 20, 2012. ^ "Ocala National Forest". U.S. Forest Service. Retrieved October 20, 2012. ^ "Okanogan-Wenatchee National Forest". U.S. Forest Service. Retrieved October 20, 2012. ^ "Olympic National Forest". U.S. Forest Service. Retrieved October 20, 2012. ^ "Osceola National Forest". U.S. Forest Service. Retrieved October 20, 2012. ^ "Ottawa National Forest". U.S. Forest Service. Retrieved October 20, 2012. ^ "Ouachita National Forest". U.S. Forest Service. Retrieved October 20, 2012. ^ "Ozark-St. Francis National Forest". U.S. Forest Service. Retrieved October 20, 2012. ^ "Payette National Forest". U.S. Forest Service. Retrieved October 20, 2012. ^ a b "Pike and San Isabel National Forest Cimarron and Comanche National Grasslands". U.S. Forest Service. Retrieved October 20, 2012. ^ Warbington, Ralph; Beardsley, Debby (2002). "2002 Estimates of Old Growth Forests on the 18 National Forests of the Pacific Southwest Region". U.S. Forest Service. Archived from the original on February 21, 2013. Retrieved October 20, 2012. ^ "Plumas National Forest". U.S. Forest Service. Retrieved October 20, 2012. ^ "Prescott National Forest". U.S. Forest Service. Retrieved October 20, 2012. ^ "Rio Grande National Forest". U.S. Forest Service. Retrieved October 20, 2012. ^ "Rogue River-Siskiyou National Forest". U.S. Forest Service. Retrieved October 20, 2012. ^ Fattig, Paul (January 23, 2011). "Tallest of the tall". Mail Tribune. Medford, Oregon. Archived from the original on February 21, 2013. Retrieved October 20, 2012. ^ "Salmon-Challis National Forest". U.S. Forest Service. Retrieved October 20, 2012. ^ "San Bernardino National Forest". U.S. Forest Service. Retrieved October 21, 2012. ^ "San Juan National Forest". U.S. Forest Service. Retrieved October 21, 2012. ^ "Santa Fe National Forest". U.S. Forest Service. Retrieved October 21, 2012. ^ "Sawtooth National Forest". U.S. Forest Service. Retrieved October 21, 2012. ^ "Sequoia National Forest". U.S. Forest Service. Retrieved October 21, 2012. ^ "Shasta-Trinity National Forest". U.S. Forest Service. Retrieved October 21, 2012. ^ "Shawnee National Forest". U.S. Forest Service. Retrieved October 21, 2012. ^ "Shoshone National Forest". U.S. Forest Service. Retrieved October 21, 2012. ^ "Sierra National Forest". U.S. Forest Service. Retrieved October 21, 2012. ^ "Siuslaw National Forest". U.S. Forest Service. Retrieved October 21, 2012. ^ "Six Rivers National Forest". U.S. Forest Service. Retrieved October 21, 2012. ^ "Stanislaus National Forest". U.S. Forest Service. Retrieved October 21, 2012. ^ "Superior National Forest". U.S. Forest Service. Retrieved October 21, 2012. ^ "Tahoe National Forest". U.S. Forest Service. Retrieved October 21, 2012. ^ "Tongass National Forest". U.S. Forest Service. Retrieved October 21, 2012. ^ "Tonto National Forest". U.S. Forest Service. Retrieved October 21, 2012. ^ "Uinta-Wasatch-Cache National Forest". U.S. Forest Service. Retrieved October 21, 2012. ^ "Umatilla National Forest". U.S. Forest Service. Retrieved October 21, 2012. ^ "Umpqua National Forest". U.S. Forest Service. Retrieved October 21, 2012. ^ "Wallowa-Whitman National Forest". U.S. Forest Service. Retrieved October 21, 2012. ^ "Wayne National Forest". U.S. Forest Service. Retrieved October 21, 2012. ^ "White Mountain National Forest". U.S. Forest Service. Retrieved October 21, 2012. ^ "White River National Forest". U.S. Forest Service. Retrieved October 21, 2012. ^ "Willamette National Forest". U.S. Forest Service. Retrieved October 21, 2012. Wikimedia Commons has media related to National Forests of the United States.